Beach cover ups could match with,tank top, bikini,swimsuit,bathing suit,bra,ect.necessary one for you. Whether it is routine to go out or go to the beach vacation, the girl beach smock will provide a good sun protection. This loose cover up swimwear is made of rayon and acrylic. You would feel very soft and comfortable when you wearing it. 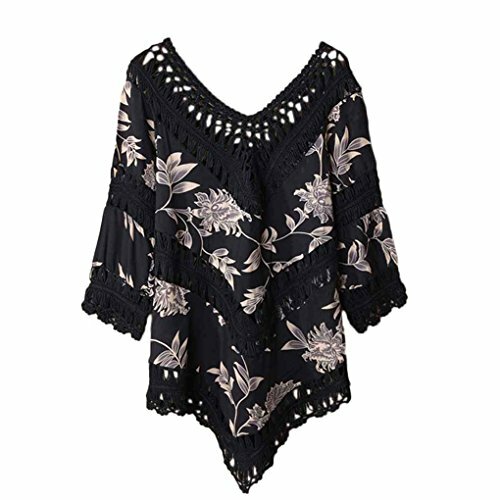 Women print beach cover up is suitable for Beach, Swimming pool, Summer Vacations or Honeymoon, making you more attractive. Recommend hand wash and hang dry with cold Water separately, rinse and line dry immediately after use, no colour fading, don't twist line dry, don't iron, don't bleach. 1 * Bikini Cover Up.